Austrian rabbi; born in Hungary in 1798; died at Trebitsch, Moravia, Dec. 16, 1879, where he officiated as rabbi from 1828 until his death. He wrote a commentary, entitled "Meḳor Ḥayyim" (Presburg, 1849; 3d ed. 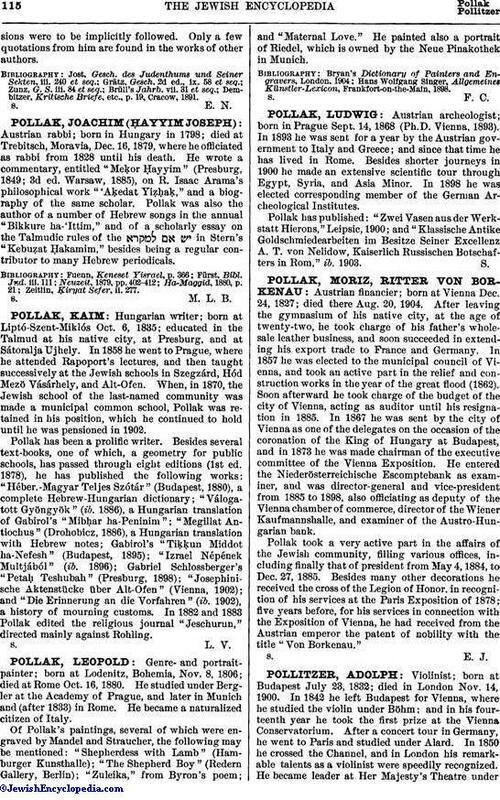 Warsaw, 1885), on R. Isaac Arama's philosophical work "'Aḳedat Yiẓḥaḳ," and a biography of the same scholar. Pollak was also the author of a number of Hebrew songs in the annual "Bikkure ha-'Ittim," and of a scholarly essay on the Talmudic rules of the in Stern's "Kebuẓat Ḥakamim," besides being a regular contributor to many Hebrew periodicals. Zeitlin, Ḳiryat Sefer, ii. 277.